The passing of Joseph Stalin in Moscow in 1953 precipitated a power struggle among his grasping associates and potential successors. 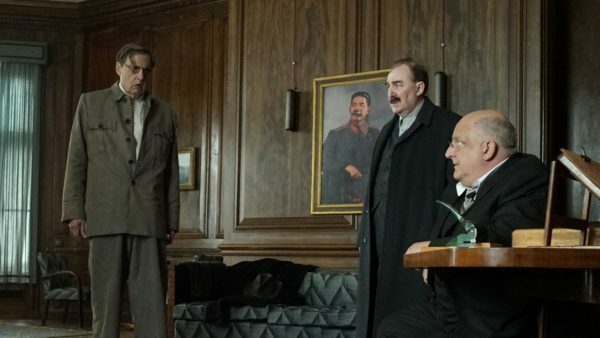 Armando Iannucci imagines what transpired in his satirical film, The Death of Stalin, which is now available on the Netflix streaming service. Iannucci approaches the topic with an irreverent sense of humor. Nothing is sacred or out of bounds. As the movie opens, mass arrests take place in the capital. Stalin, being paranoid, has a long list of enemies, real and imagined, to purge. Since gaining power, he has always resorted to purges to sideline or eliminate political opponents. With security forces fanning out to arrest his adversaries, Stalin (Adrian McLoughlin) orders a classical music concert to be recorded for his listening pleasure. It’s an annoying demand because the musicians in the orchestra must go back to work again late at night. The two technicians assigned to record the symphony are nervous. A slip here or there could be fatal in a police state like the Soviet Union. Adding to their woes is the refusal of the pianist, Maria (Olga Kurylenko), to cooperate. She hates Stalin with a passion, but finally agrees to participate in the recording. In the meantime, Stalin and his cronies enjoy a convivial meal together. Being sycophants beholden to Stalin, they all laugh at his jokes. Among the guests are Nikita Khrushchev (Steve Buscemi), Vyacheslav Molotov (Michael Palin), Lavrentiy Beria (Simon Beale) and Georgy Malenkov (Jeffrey Tambor), some of the country’s most powerful men. The majority of the actors are Britons and speak with a British accent, which is a little off-putting. Clearly, Iannucci was not interested in having the performers learn pseudo-Russian accents. When Stalin is handed the newly-pressed record, he retrieves a note in the sleeve. Written by Maria, it’s a scathing indictment of his dictatorial rule. Amused and indignant, he collapses, the victim of a cerebral hemorrhage. 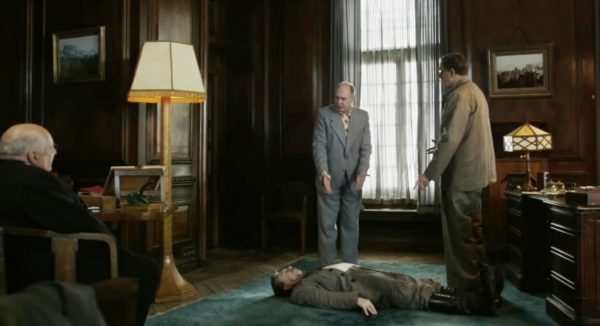 Stalin’s personal attendant finds him on the floor of his office. In due course, the members of the Politburo arrive. Beria, the head of the dreaded secret service, rummages through Stalin’s drawers and burns some files. Not being entirely certain that Stalin has expired, his bumbling colleagues decide that a doctor must be called to examine him. Someone points out that the finest doctors in the land are dead or confined to a gulag. This is an implicit reference to the infamous Doctors’ Plot, during which a group of prominent physicians, many of them Jewish, were falsely accused of trying to poison Stalin. 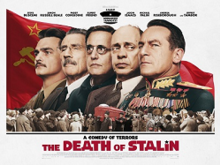 Iannucci portrays the majority of Stalin’s would-be successors as a bunch of power-hungry schemers and opportunists partial to double-talk and loyal only to themselves. Beria, who will be accused of treason, anti-Soviet behaviour and multiple rapes, is the worst of the lot. Now pretending to be a reformer, he claims he was “misled” by Stalin. Malenkov, chosen to be Stalin’s heir apparent, seems confused and somewhat out of touch with reality. Molotov appears grounded. Khrushchev emerges as fairly credible figure, the harbinger of constructive change. Stalin’s only high-ranking Jewish official, Lazar Kaganovich (Dermot Crowley) is mostly silent, a cipher. Stalin’s son, Vasily (Rupert Friend), comes across as a dissolute ne’er-do-well given to spouting antisemitic slogans. The black humor, while sometimes hilarious, is effective only to a certain degree. The jokes eventually grow stale and grate on the nerves. The Death of Stalin has its moments, but on the whole, it rarely rises above the pedestrian level.